With Christmas being only 8 days away, I'm feeling rushed but accomplished. If you follow me on twitter and instagram, you will see that we have been up to our throats in house projects. Finally, after this past weekend our house is a home. Every room is freshly painted, slate and hickory wood floors are through out. Shabby chic mixed with vintage and random punches of color are on the walls. Now awaits the finishing touches. We need rugs in all 3 bedrooms up stairs. Doo dads and antique nicknacks for shelves. You know, the kind of stuff that ads up.....I have contemplated draining our saving and just finishing everything, but then we'd be po' and that ain't happening lol. My presents are wrapped and under the tree, but I still feel unprepared. I don't think I've ever felt prepared for the holidays. I'm excited to host Christmas eve this year at our home! However, that entails cooking and baking and cleaning. I'm trying to just relax and roll with it but it's tough for me. This weekend was a busy but fun one. Thursday night was date night and the hubs and I took my mom with us for sushi! She just started eating it and loves it! I also came home to this after dinner. Saturday, I woke up to this. It's a moment like this that makes me take a picture of him. I wonder what he's seen and been through while deployed. But when I see him sleeping soundly like this, he's safe, he's home and he's mine. However, my phone was not on silent and I didn't know the flash was on, so lets just say husbands were pissed. LOL. My sister and I tackled the upstairs for 4 hours on Saturday. We organized and cleaned up all the construction mess and headed to her house later that night for a clam boil. 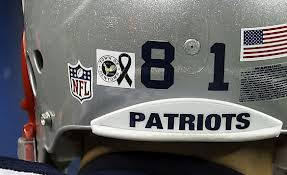 The Patriots are forgiven due to the Town of Newtown stickers that they added to their helmets. Now to the subject every one is talking about, because you can't not talk about it. I will be participating in the blogger silence tomorrow in lieu of the Newtown disaster. I cried my eyes out all day on Friday and can't not even put my emotions in to words. I went to Sunday mass with my sister and prayed for these families. I prayed for comfort for them. What has always helped me through was a saying that I heard after my brother passed away and it's also in my nightly prayers. I pray that if any one is having a hard time with losing a loved one to remember that they will meet back up with them in eternal life. One day we will all meet again, and I firmly believe that. I'm sharing your football feelings - the Giants got shut out. That hasn't happened since around '96. I was NOT a happy camper. my hubs was SO MAD at that game (he's a huge patriot's fan) that he ended up shutting the tv off. 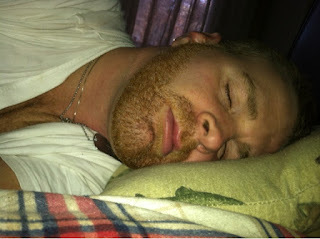 i love watching hubs sleep; they look so peaceful, don't they? as for that awful tragedy in CT... i have no words. my heart goes out to all those who have been affected by that awful thing. 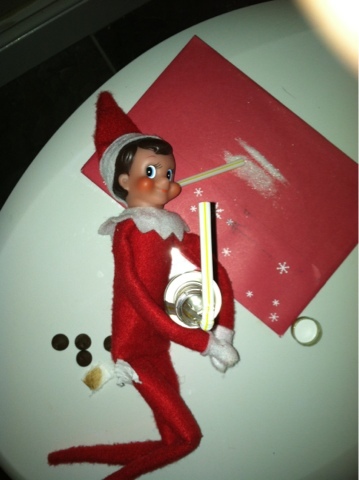 that elf picture cracks me up!